The Soil Moisture Operational Products System (SMOPS) combines soil moisture retrievals from multiple satellite sensors to provide a global soil moisture map with high spatial coverage. 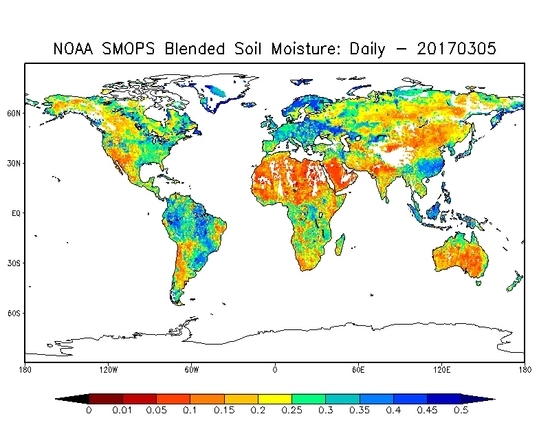 SMOPS provides a seamless soil moisture map over global land from four satellites, including GCOM-W1, SMOS, Metop-A, and Metop-B. The global soil moisture maps are generated in daily intervals with the most recent 24 hours of soil moisture from multiple retrieval algorithms, and mapped with a cylindrical projection on 0.25 x 0.25 degree grid. For each grid point of the map, the output includes soil moisture values as a percentage (vol/vol) of the surface (top 1-5 cm) soil layer with associated quality information and metadata. The daily product is available in netCDF file format. The archive period of record begins in March 2017. See the Details Section below for more information. Product data family search page. Search and submit an order for the dataset via a text-based interface. Page with descriptions of the product algorithm including the ATBD. Purpose This dataset provides quality measurements of soil moisture variables from multiple instruments and platforms. For a complete description of use limitations for this dataset, refer to the Algorithm Theoretical Basis Document.